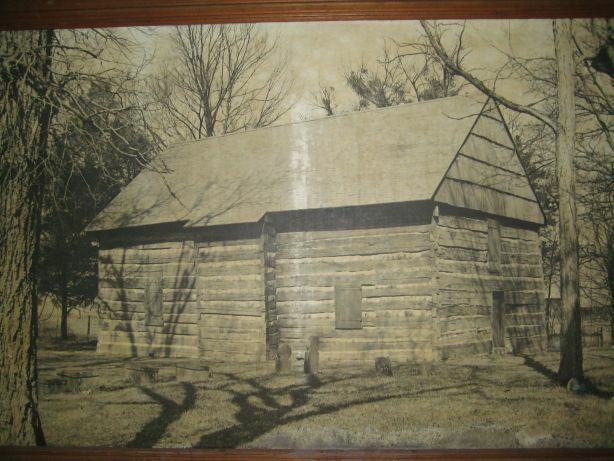 On May 23, 2007, I wrote of my discovery that the greatest Christian revival in early American history took place in central Kentucky, in August 1801. Here are the pictures I took today, when Leive, Rezia and I visited the site of the Cane Ridge Meeting House. 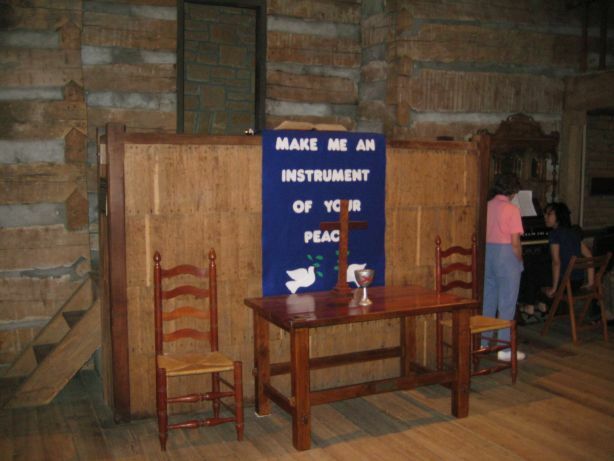 This is also considered the birthplace of the various Disciples of Christ and Church of Christ denominations, because several ministers met here in 1804 to declare their separation from the Presbyterian Church. Note: To keep the calendar and links in the left-hand margin of this blog, your browser will cut off the right edge of each picture. Evidently horizontal scrolling is not permitted here. Click on any picture to see the whole thing. We picked a good day to show up, because a church conference is scheduled here for next Saturday. The site is a very peaceful and pleasant rural neighborhood, making it perfect for such meetings. Here you can see my Buick parked in front of the main building, while Leive and Rezia look around. They didn’t realize until I went over to join them that they had walked into a cemetery! Another view of the cemetery, with Leive in the foreground, Rezia in the background. 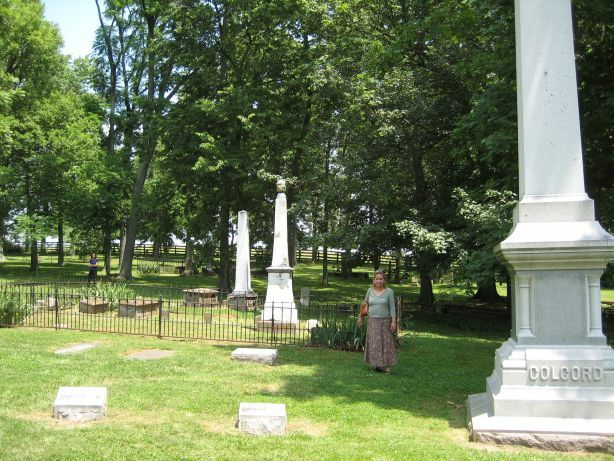 Unlike most such places in the 19th century, both white and black parishioners are buried here, because the most important pastor at the revival, Barton Warren Stone, was also an early Abolitionist. 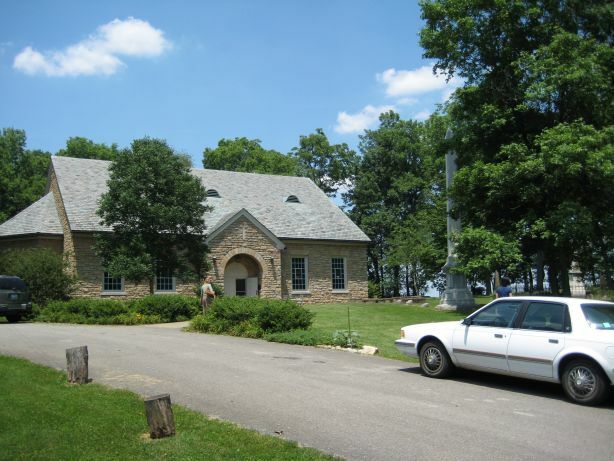 The main building turned out to be a limestone and stained-glass superstructure, built over the original log cabin in the 1950s to protect it from the elements. Inside the cabin. 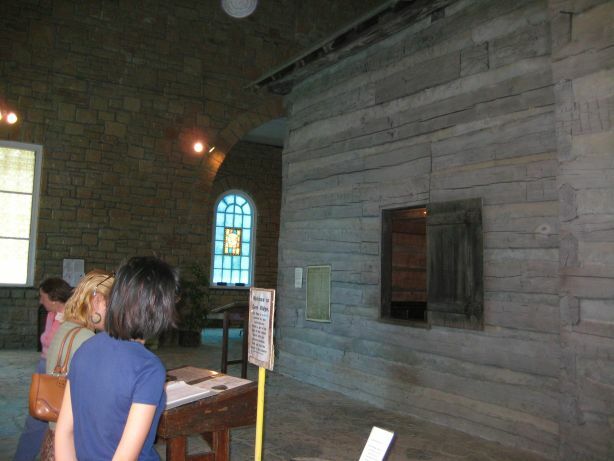 It reminded me of Christ Episcopal Church in Longwood, FL, though it’s larger, and as you can see, they had a balcony for the slaves. In fact, this is supposed to be the largest log structure still standing in North America. Here is the pulpit. If you climb the steps you will find several Bibles up there. The curator told us that weddings are sometimes held in this building. 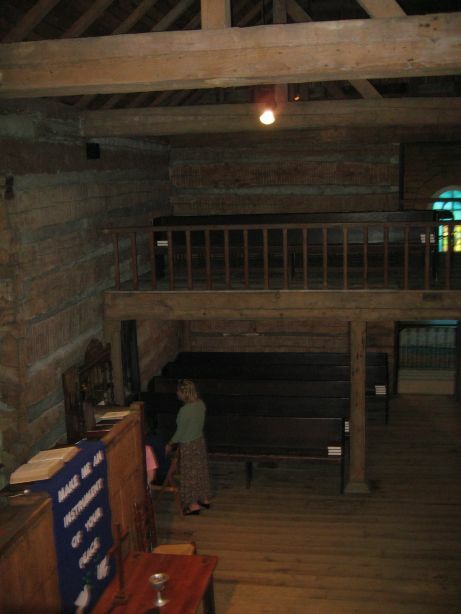 In the back is a piano, and in the front is a pump organ; of course Rezia had to try both. 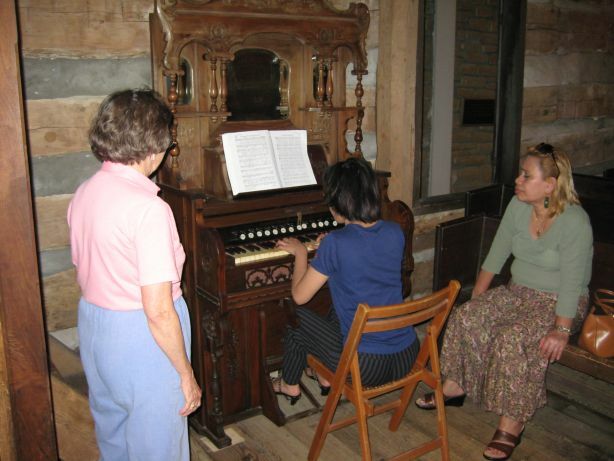 A closer view of Rezia at the pump organ. She had to constantly move the pedals underneath in order to get sound to come out. She succeeded in playing it, but because they didn’t have a proper stool to sit on, she kept slipping; Leive had to put her hand on the chair until the last song was finished. 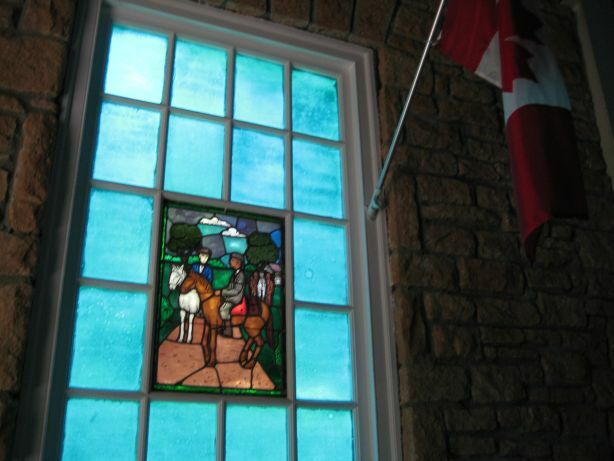 Much of the history of the place is retold in the stained-glass windows on the superstructure. Here is one of Archibald McLean, a Canadian-born clergyman. A photograph of the log cabin, taken after its most recent restoration, in 1932. The pews you saw in the previous pictures were installed some time in the twentieth century. 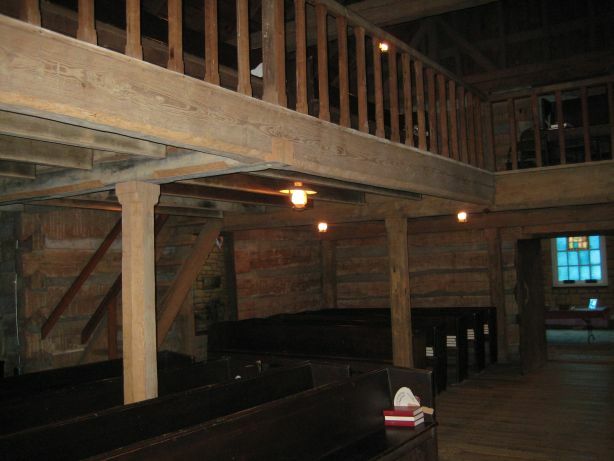 Here Leive sits on the last of the first set of pews, which date to the1880s. 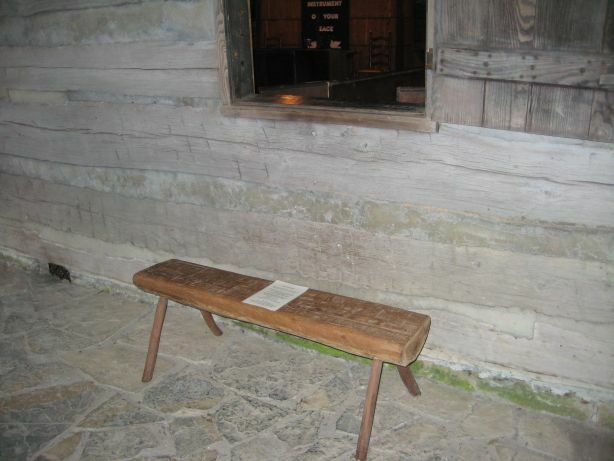 At the time of the revival, most folks sat on log benches like this one. Leive demonstrates how Cane Ridge got its name. 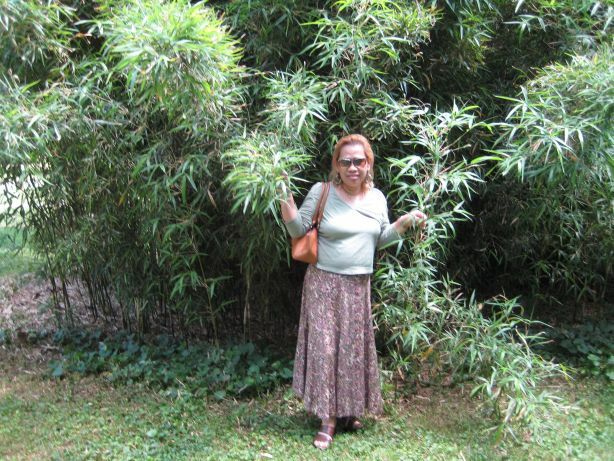 When Daniel Boone traveled through the area, he saw wild bamboo like what you see here, and thought it looked like sugar cane. We concluded our visit with a trip to the small museum near the entrance gate. 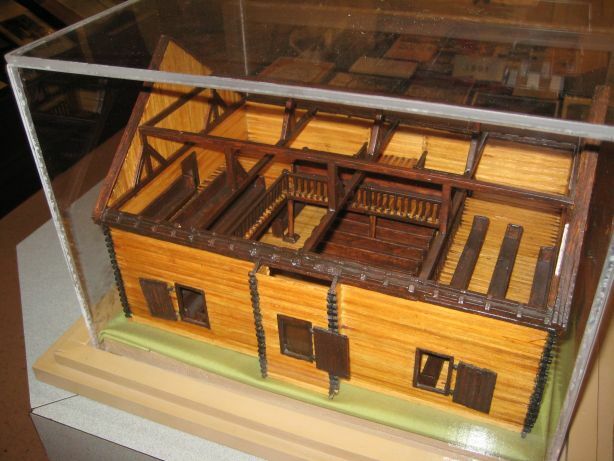 I found this interesting: a scale model of the log cabin, about 18 inches long, built out of matchsticks! 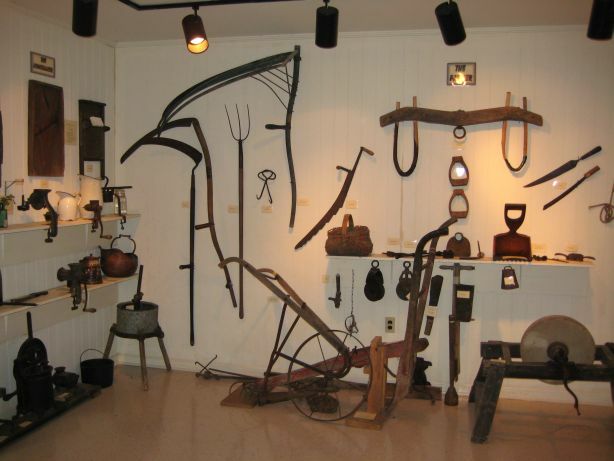 The rest of the museum was filled with artifacts from Cane Ridge, like the 19th-century tools shown here, and some artwork of the place done by visitors. Charles . . . you and Leive will have to check out Shakertown too. The Shakers were a movement similar to the Quakers. 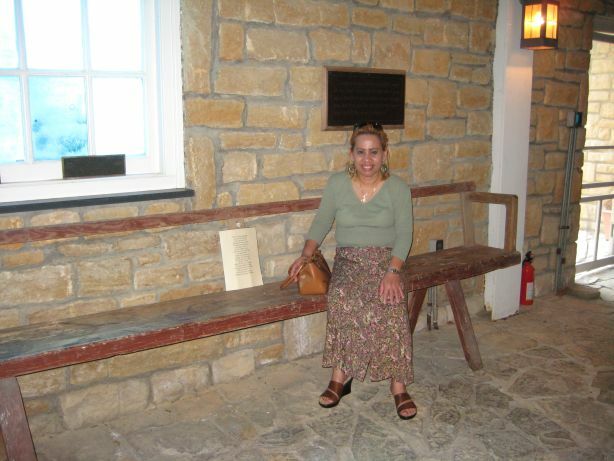 They came to Kentucky because of the manifestations reported at Cane Ridge. The Shakers were very ascetic and believed that ecstatic mystical experiences help them to overcome sexual urges. To help them to get under the control of the Spirit they played music and danced. So in all their houses pegs were built into the walls of their rooms so they could hang the furniture on the walls so they could dance. 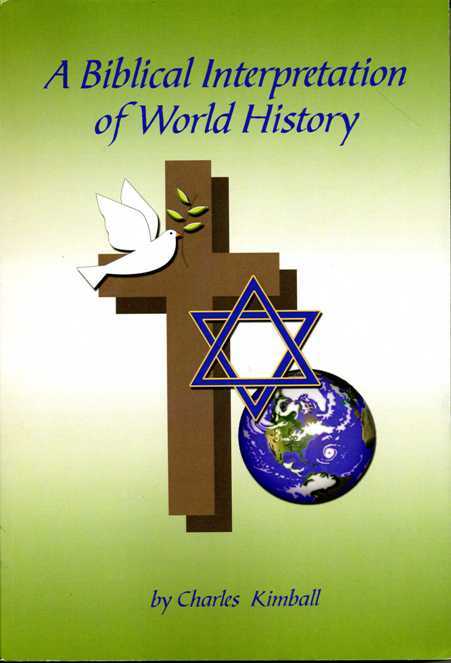 BTW – They were viewed as a heretical. Check out http://www.shakervillageky.org/. Loved your pics. I JUST learned of my great great Grandfather’s participation at this revival. he lived there in Bourbon County. His Name was Jacob Dabenspeck. Marrried to Elizabeth Mock. problem in my end or if oahu is the blog. Virtually any opinions would be significantly appreciated.